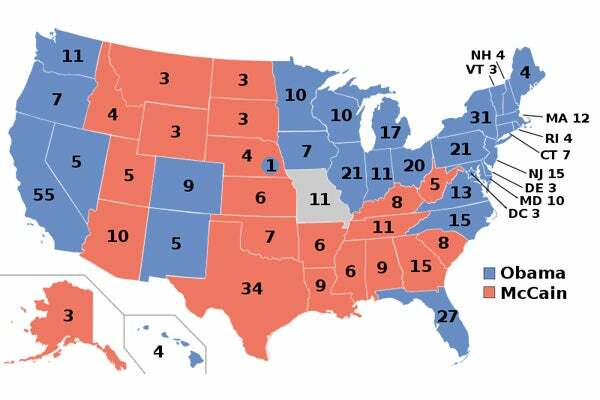 If you haven’t watched much of the second-by-second coverage of presidential elections in the past (and if you were busy scoping out the hotties during civics class), you may be having a hard time remembering exactly how the Electoral College works. But don’t worry – we’ve got you covered. The process by which we elect our president today actually originated in the Constitution as a compromise; some of the founding fathers wanted the president to be elected by Congress, and others wanted it to be based on the popular vote. What does that mean to us now? The Electoral College chooses the president. But we help choose the electors. Each state’s number of electors is equal to its number of members of Congress (representatives plus senators). Washington also has three electors, so the total number of Electoral College members is 538. The electors vote based on the popular vote in the state they represent — and all but Maine and Nebraska have a “winner-take-all” system, in which the presidential candidate with the most votes in the state gets all the Electoral College votes. So, yes, the president can (and has in the past — think 2000) win the election without winning the popular vote. Since a candidate needs 270 votes to win the presidency, that means it’s technically possible for the Electoral College to split evenly down the middle. While that seems extremely improbable, consider this: Dixville Notch, N.H., a tiny town that votes at midnight and has correctly forecast the last three elections, had its first tie (since 1948!) this year. And the national polling has been pretty tight. What happens if no candidate gets 270 electoral votes? Total chaos (just kidding!). The House of Representatives would elect the president from the three presidential candidates with the most electoral votes, and the Senate would elect the vice president from the two VP candidates with the most electoral votes. It isn’t easy to predict how that kind of vote would go, since each state delegation in the House would only get one vote. Let’s keep our fingers crossed it doesn’t come to that.